Lights On Afterschool in October! Each October, 1 million Americans and thousands of communities nationwide celebrate Lights On Afterschool (LOA) to shine a light on the afterschool programs that keep kids safe, inspire them to learn and help working families. There are plenty of ways to celebrate! 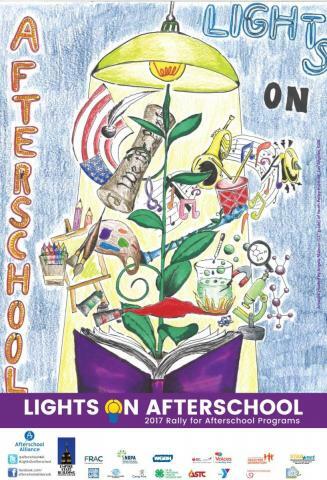 Lights On Afterschool is a great opportunity to connect with parents, local businesses and community organizations, city leaders, potential funders, and the general community. LOA activities can range from a simple art contest, a parent night, or an all-out community-wide event! Visit the Afterschool Alliance for more information, ideas, and resources. Thank you for keeping the Lights On Afterschool! Do we have to celebrate on the actual Lights On a specific date? It's not good for our school schedule. No, you may hold your event at any time during the month of October (or even September or November)! The important idea is that you're showcasing your program and building support from parents, administrators, city officials, and the community. Do we have to have a big huge party? No, many programs have something much more low-key like a family literacy night, family math night, or an afterschool open house where afterschool staff have a chance to talk to parents, get feedback, and offer opportunities to get involved. What is this about the Press? I don't know anything about press releases and media alerts. That's okay! You don't HAVE to invite the press or media. But with a little forethought, a press release is simple and easy to write. The Afterschool Alliance has media materials already pre-written to help you, all you have to do is fill in your program name and information! Any media materials should be written before contacting them, which also alleviates stress around meeting the press. You can also take a picture and provide a short caption, and send it to your local newspaper to be included in the paper. That's a really easy way to share your great afterschool program with the rest of the community! Don't forget to share your event with us too! We would love to highlight all our 21st CCLC Lights On Afterschool festivities on our website and in our October and November e-alerts. Email pictures and a brief summary of how your event went to Hannah Smith. We will also forward it to the Afterschool Alliance to be posted on their website - let's represent Oklahoma! The Afterschool Alliance has a plethora of planning materials and resources to help you! Check out their Lights On event planning page for everything from press materials to pictures for coloring, partner logos, and TONS of great ideas to get your creative juices flowing.